DUMBARTON gained a well earned draw against Ladbrokes Championship second-placed Falkirk at the Cheaper Insurance Direct Stadium. DUMBARTON gained a well earned draw against Ladbrokes Championship second-placed Falkirk at the Cheaper Insurance Direct Stadium in front of a 740 crowd. The fans and viewers of Gaelic TV station BBC Alba saw a scrappy first half with goal chances few and far between, although Christian Nade had a close range effort chalked off for offside. The second period was exciting from start to finish. Peter Houston's dominated the early stages but found keeper Jamie Ewings in fine form. Falkirk took the lead in controversial circumstances when John Baird converted a hotly contested penalty which saw Sons left-back Mark Docherty sent-off for handball. 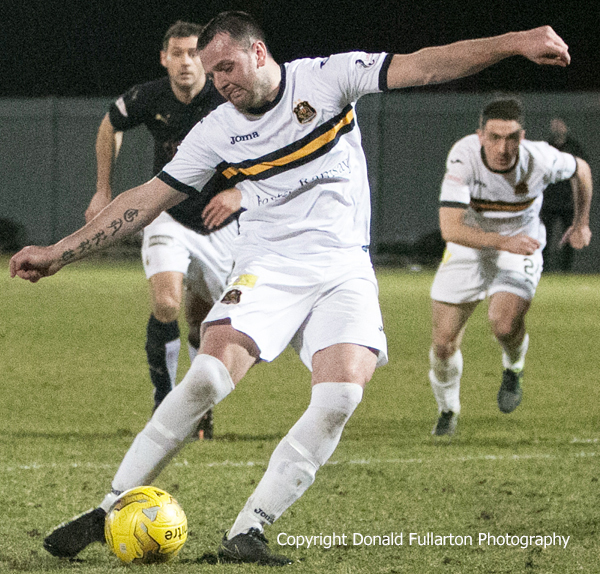 Spurred in by a sense of injustice, 10-man Dumbarton took the game to the visitors and thought they had equalised when Gregor Buchanan headed home a Calum Waters free-kick. But the standside linesman flagged for offside to keep the Bairns. Former Sons keeper Danny Rogers then barged into Nade to give referee Andrew Dallas his second penalty decision to make. Much to the delight of the home support, Garry Fleming netted the spot kick almost on the full time whistle (pictured.